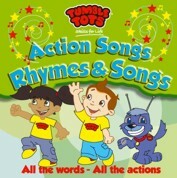 Watch out little ones..Tumble Tots Action Songs are back!! We've got another great selection of Rhymes and Songs to keep the little ones happy and active for hours! Complete with a booklet containing all the words and actions, this CD is sure to continue the incredible success story of the Tumble Tots Action Songs series. 25. Tumble Tots Are Great!